Maksimenko, “Water with Clouds,” Oil on Canvas, 51 x 71 in. 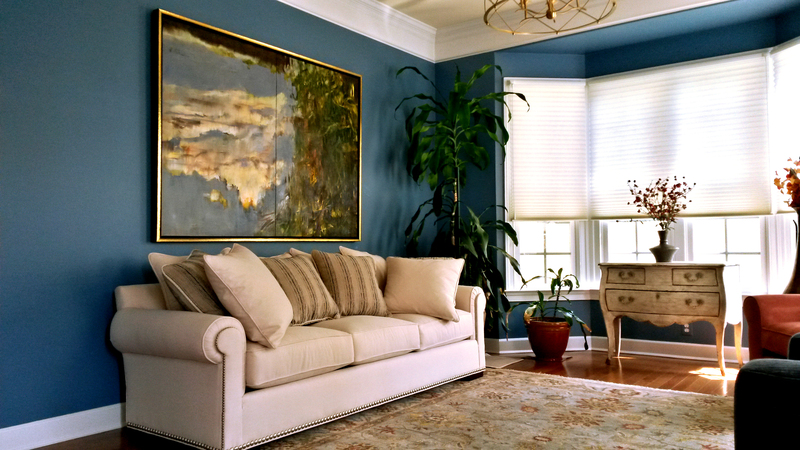 This beautiful light-filled living space sets a definitive tone with its rich blue wall color and array of flora. The calming, reflective water in Maksimenko’s painting, “Water with Clouds” extends the room’s aesthetic, and also mimics the leafy pattern of the tropical dracaena plant to its right. With a thoughtful balance of light, texture and color, this room becomes an ideal spot for peace and reflection.